MANILA, JUNE 19, 2012 (ABS-CBN) By Vladimir Bunoan - The group that pioneered the modern buffet restaurant in Manila is not about to relinquish its leading position as it further rolls out its latest concept: Sambo Kojin, a yakiniku "grill-all-you-can" restaurant offering Japanese and Korean dishes. Sambo Kojin recently opened its third outlet at the ground floor of the newly refurbished Kamayan restaurant along West Avenue in Quezon City with Kamayan, Dads and Saisaki occupying the second floor. Bokie Villavicencio, the brand head of Sambo Kojin, told ABS-CBNnews.com that they decided to renovate the entire building to include Sambo Kojin since the old Kamayan restaurant in Quezon City needed a facelift. And since it opened in late May, the response to the Japanese-Korean buffet restaurant has been very positive, he said. Sambo Kojin actually opened its first outlet at the Eastwood City Walk in Libis, Quezon City in November 2010. A few months later, in March 2011, the group unveiled its newly renovated restaurant along EDSA in Quezon City with the second Sambo Kojin branch occupying the second floor and Kamayan, Dads and Saisaki on the first floor. Villavicencio said there are plans to open a fourth Sambo Kojin restaurant "in the south." Villavicencio's father, restaurateur Vicvic Villavicencio, president of Firstfoods Food Services Inc. (formerly the Triple-V Group), shook up the restaurant industry in the mid-1990s when he opened the buffet restaurant Dads at the SM Megamall at a time when buffets were basically limited to the top hotels. Dads' buffet was tailor-made to the Filipino taste with an array of dishes that are usually served during special occasions and fiestas, highlighted by a carving station serving US Angus beef. Moreover, Dads' no-leftovers concept, which rewards diners with a 50% discount from the regular buffet price if they finish their food, helped expand the market for buffets. The no-leftovers rule has since become a standard in the industry. Eventually, Dads and the group's other restaurants, Kamayan and Saisaki, merged their respective buffets. Guests can pick just one buffet -- Kamayan, for instance -- or partake of all three. Kamayan also introduced a popular merienda buffet at select outlets. While the popularity of buffets normalized -- due partly to the increase in health consciousness among consumers, as well as periods of economic uncertainties -- buffets made a strong comeback when the five-star hotels tweaked the concept and introduced "kitchen theaters," with chefs preparing some dishes a la minute. Soon, new free-standing buffet restaurants catering to the large appetites of Filipinos started opening in the metro. Bokie Villavicencio isn't surprised that buffets regained their popularity. "Filipinos love to eat different kinds of food," he said. His sister, Mara, the brand head of Dads’, Kamayan and Saisaki, however, stressed that their restaurant group has an advantage in that customers know that their food is consistently good. "We've been here for so many years already," she said. "But there's always room to innovate. We have gone through a lot of changes. We have to be always better." The group strengthened its offerings by renovating his existing restaurants and introducing an entirely new product, Sambo Kojin. The Villavicencio children, who have taken over the daily operations of the group, said the concept of Sambo Kojin started over a family dinner. Bokie Villavicencio admitted that he has always loved yakiniku. While the group already has a Japanese restaurant in Saisaki, technological developments which gave rise to table-top smokeless grills made it possible to come up with the Sambo Kojin concept. Mara Villavicencio said the "grill-all-you-can" concept would be difficult to merge with Saisaki's buffet. "It's going to be too overwhelming," she said. "It's perfect for this concept." They also invested on chillers to guarantee fresh food offerings, making the yakiniku experience all the more satisfying for diners. Despite the tumultuous history between the Japanese and the Koreans, their cuisines actually go well together. As such, lovers of Korean cuisine would definitely find Japanese food just as appetizing -- and vice versa. 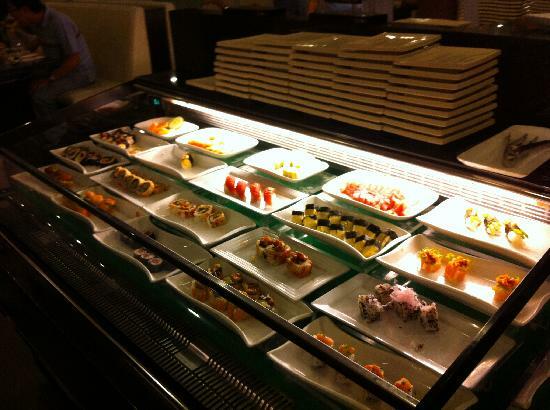 Sambo Kojin's buffet offers the most popular dishes of the two cuisines without totally overwhelming the guests. Indeed, it is feasible to try out a majority of the items on display. The items are also conveniently organized: the sushi and sashimi are displayed in their own chillers, with the Korean kimchi just nearby. Another set of chillers have the various fresh meat ready to be grilled. The US beef are wonderfully marbled and have been pre-marinated to suit the different tastes of the customers. There are also strips for pork bulgogi, chicken, salmon, mahi-mahi, squid, prawns and shrimps and crabstick. There are also several bacon-wrapped rolls featuring enoki and asparagus, as well as fresh vegetables. The tempura dishes are in another corner, constantly being refilled in small batches. Another section is devoted to Korean dishes like the excellent beef stew and chap chae, separate from the Japanese dishes like gyoza and tofu steak. The sushi bar can inspire gluttony with its amazing variety of salmon, tuna, tamago, ika, kani, California maki, shake maki, tekka maki, futo maki, sakana chiisu maki, thunder roll, tropical roll and California unagi roll. But as veteran buffet eaters know, one should try to avoid the starches. So focus on the sashimi instead, which includes the prized uni (sea urchin) -- already worth the price of the buffet. Each table is also provided with six different kinds of sauces, from the spicy to sweet. Although the meats are already pre-marinated, do add the sauce of your choice when cooking the meat for added flavor. The special Sambo Kojin sauce also provides slight caramelization to the beef. The restaurant also serves kamameshi rice on top of the ordinary steamed rice. With its glutinous texture and slightly sweet taste with bits of steamed vegetables on top, this rice is quite heavy so just get one and share with the group. The dessert spread is relatively modest with fresh fruit, a chocolate fondue, several cakes and ice cream -- just enough to punctuate the meal. Drinks are not included in the buffet price so check the price before ordering. Overall, if you like Japanese and Korean cuisine, Sambo Kojin is going to be heavenly. Sambo Kojin’s No Left Over, eat-all-you-can lunch is priced at P495 from Monday to Friday (except for holidays) and P595 on Saturdays and Sundays; No Left Over Dinner is priced at P595 daily.